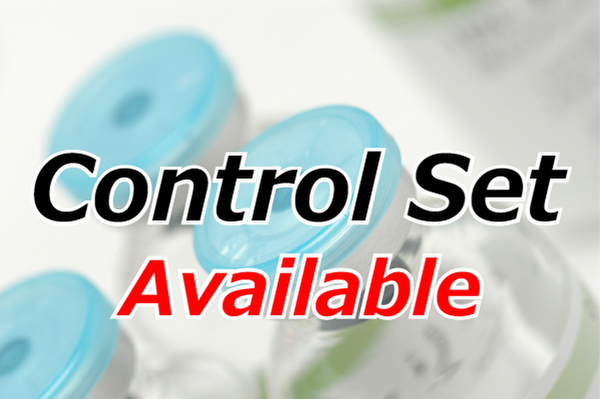 Human serum, EDTA Plasma, Heparin Plasma, Citrated Plasma, Urine and cell culture supernatant. α-Klotho (Alpha Klotho) was identified as an extremely down-regulated gene in the genetically-modified mouse of which phenotype is very similar to various symptoms of human aging. The sequences of Alpha Klotho genes have been identified in various species including humans based on the one of mouse. 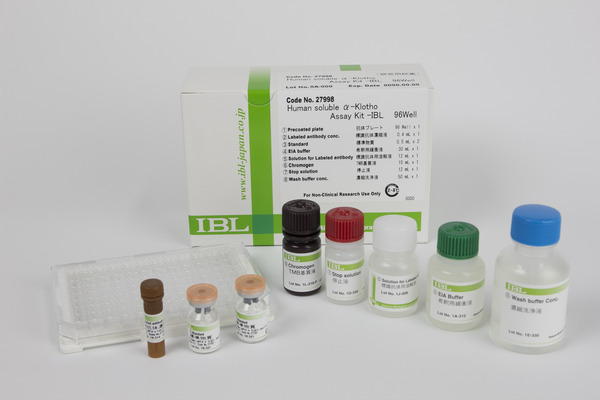 Alpha Klotho protein is a 130 kDa, one-transmembrane protein and its expression is confirmed in the kidneys and the parathyroid glands. In recent years, it has become clear that Alpha Klotho is an important molecule within a living organism regulating the metabolism of mineral such as calcium and phosphorus. It is considered that in Alpha Klotho mouse, early aging-like symptoms are induced by impaired mineral homeostasis caused by decreased expression of Alpha Klotho. 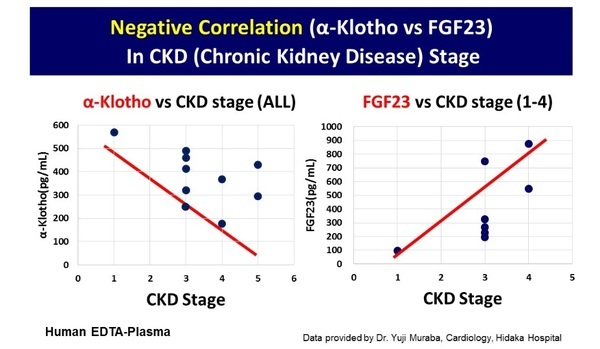 Meanwhile, it is reported that the long N-terminal extracellular domain which comprises the major portion of sequence of Alpha Klotho protein is released free into blood by shedding. 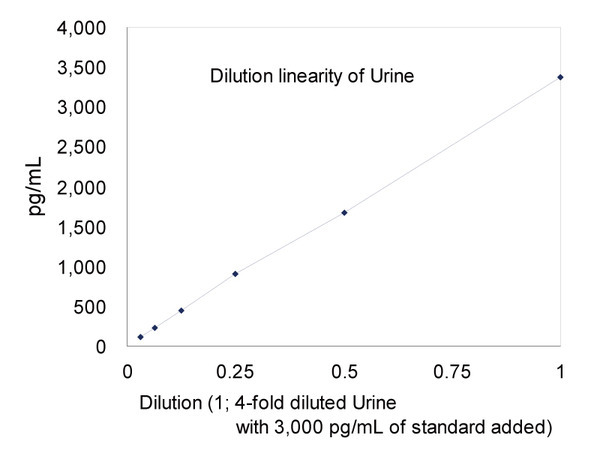 However, there are many unclear points about functions and changes in concentration of free (soluble) Alpha Klotho protein, so it was required to develop the measurement system of Alpha Klotho. 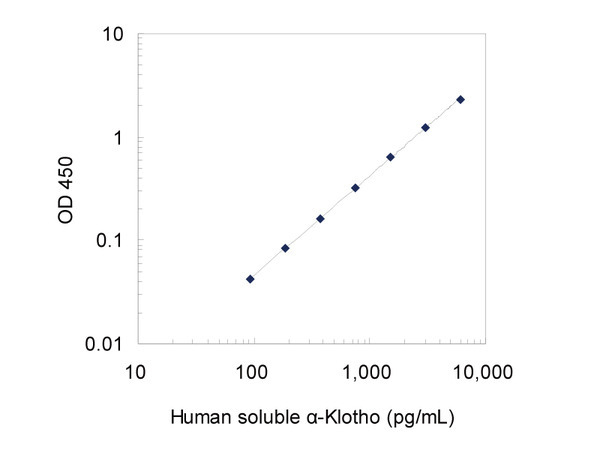 This ELISA kit can measure Human soluble Alpha Klotho protein in human blood. Q.Can this kit measure the full length of α-Klotho? A.Yes, it can be used to measure the full length α-Klotho and KL1. Q.What are the epitopes of pre-coated antibody (Anti-human Klotho (67G3) Mouse IgG MoAb A.P.) and HRP conjugated antibody (Human Klotho (91F1) Mouse IgG MoAb Fab’ A.P.)? A.Klotho has two domains (KL1 and KL2). 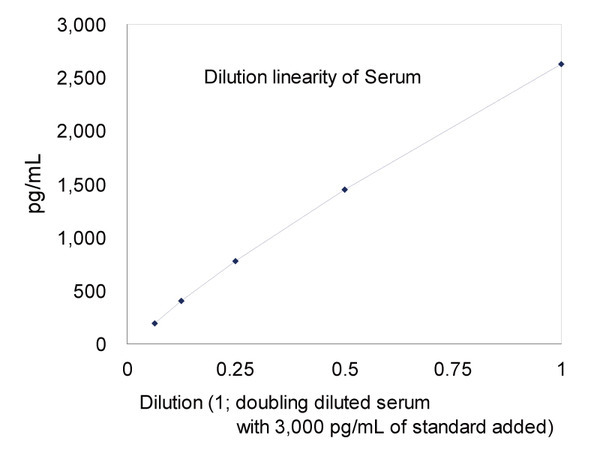 Although we have not conducted epitope mapping, these antibodies can detect KL1 domains. Q.Can rodent (mouse or rat) sample be used for this kit? Q.Is any sample stability data available? A.Yes, it is available on the following relevant product page. Please refer to the Pamphlet 2 listed on the page. Q.What kind of plasma sample can be used? 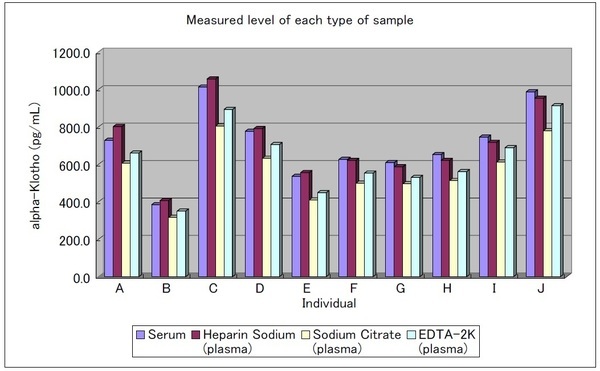 A.Typical data of the performance of the kit were obtained using human serum, EDTA-plasma, urine and cell culture supernatant for this kit, however, as you can see the data of heparin-plasma and citrated plasma measured by this kit displayed on this product page, they can be also measured by this kit. Q.What is pM unit of standards? 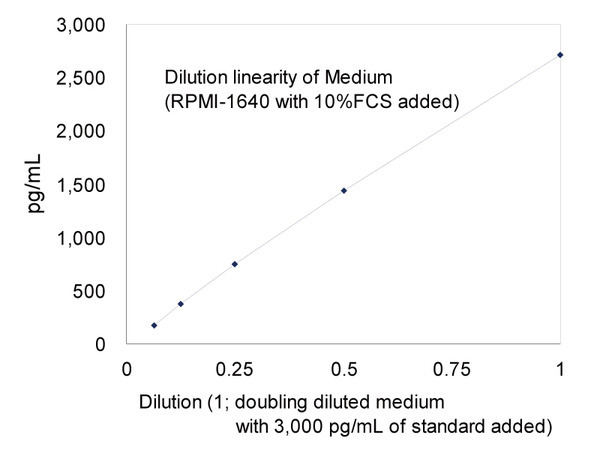 A.The 6,000pg/mL of standard in this kit corresponds to 55pM (as Molecular Weight 108.99kDa). 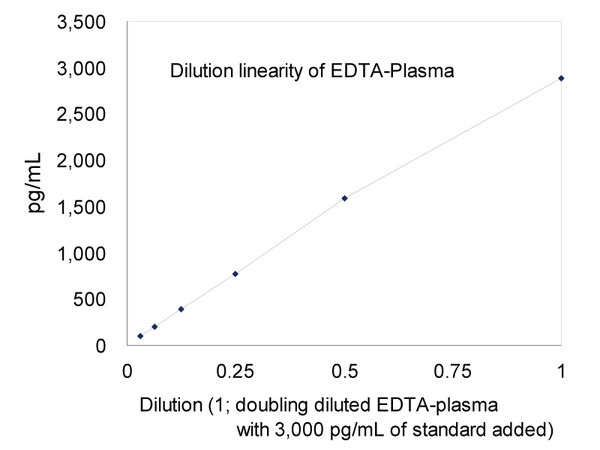 Please refer to the article Establishment of sandwich ELISA for soluble alpha-Klothomeasurement: Age-dependent change of soluble alpha-Klotho levels in healthy subjects YYamazaki et al. Biochem Biophys Res Commun. 2010 July 30; 398(3): 513–518 (PMID 20599764 / https://www.ncbi.nlm.nih.gov/pubmed/?term=20599764 ) for further information of development of this kit.